Lobos island means Sea Lions Island and is located only 6.2 miles (10 kilometers) northeast of Puerto Baquerizo Moreno, capital of Galapagos and main populated area of San Cristobal Island. Lobos Island is home for many sea lions who welcome you as soon as you arrive to this flat island. You can also observe blue-footed and nazca boobies as well as frigate birds. Snorkeling is great around this island. Dry Landing, is located at the eastern end of Isla San Cristobal. Is a group of eroded volcanic cones, sparsely populated by endemic vegetation of the islands. it is located at the eastern end of San Cristobal Island and it is a place populated bu red-footed, blue-footed and nazca boobies. 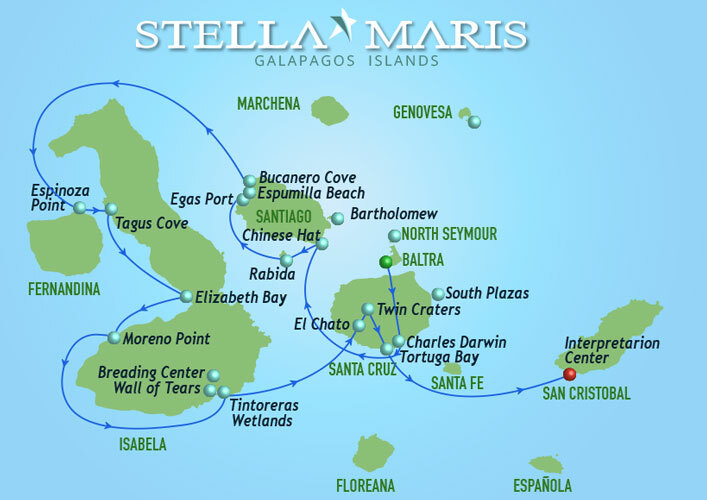 Located in the northern coast of San Cristobal Island and is well known for the beautiful beach it has with white sand and the abundance of wildlife like blue and red-footed boobies, sea turtles, sea lions and frigate birds. The clear water in this point offers a fantastic opportunity for snorkeling. Located on the north-eastern coast of Hood, Gardner Bay provides an excellent beach for relaxing, swimming and the opportunity to observe sea lions. Here we can also observe sharks in the crystal clear ocean waters. This rocky land spot sustains one of the most impressive and varied colonies of sea birds in the Galapagos. Along its southern shore, high cliffs rise up from the sea affording the visitor spectacular views of soaring birds, and of the blow whole where water spouts up to 50-75 feet into the air according to the intensity of the surf. This site offers probably the best Flamingo lagoon in the Galapagos; it is also one of the largest in the islands. Its situated between two tuff lava cones that give the area a special atmosphere. There are various species of shorebirds to be seen besides flamingos; the most frequent are common stilts, white-checked pintail ducks and other migratory birds. This is a unique zone due to the high percentage of endemic plant species. It is also very interesting to see the two distinct beaches: “The Green Beach” (due to its high percentage of olivine crystals in the sand) and the “Flour Sand Beach” which is made up of coral. Historically, this site is the location of a wooden barrel that was placed in the 18th century by the crew of a whaling ship. It has been used since this time by mariners and tourists as a post office. The idea is to carry letters or postcards to their destination by hand. Apart from being the Post Office Barrel, this site was the landing area for some of the first colonist. Breakfast in the morning. Dry landing. On this island you can see blue-footed boobies, colonies of frigates, fork-tailed gulls, terns, sea lions, lava lizards and land iguanas. Palo Santo trees can also be observed. is the only northern island of the Archipelago open to visitors This 14 sq km. island is the tip of a submerged shield volcano that rises 76 meters above the sea level. Its central crater is filled with salt water. Ocean erosion created the Darwin Bay on the southern slope. Genovesa lacks on reptiles, except for the Marine Iguanas. It is a paradise for sea birds, including large colonies of the Red-footed Boobies and Great Frigatebirds. Swimming, snorkeling and dingy rides are available. Prince Phillip's Steps (El Barranco). This is the breeding ground for the tree-loving Red-footed Booby and the ground-nesting Masked Booby. This is also home to four species of Darwin Finches: the Large Ground Finch, Sharp-beaked Ground Finch, Large Cactus Finch and Warbler Finch. Natural history enthusiasts will recall that Charles Darwin's observation of varied adaptations of finches beaks helped inspire his theories on natural selection. Genovesa is also home to the indigenous Galapagos Mockingbird and the Galapagos Dove. If we have time, we'll snorkel at El Barranco on the west side of Darwin Bay. One of a pair of small uplifted islands a short distance from the east coast of Santa Cruz, South Plaza has unique Sesuvium plants and Opuntia cactuses scattered across the landscape which provide some of the most interesting wildlife observations available in Galapagos. Land iguanas are easily seen from the trail, frequently under the shade of cactuses, waiting for a prickly pear to fall. Swallow-tailed gulls, along with various other sea birds, use the rising air to glide effortlessly over the escarpment and the protected rocky seashore is prime habitat for a large colony of noisy sea lions. snorkeling in the rocky coast of the island to see a variety of fish and sea turtles. Later. Wet Landing. You can see colonies of sea lions, land iguanas, frigate birds, Galapagos doves and lava lizards. On the island you can see a forest of giant cacti and Palo Santo trees. We will start our cruise with a visit to the Charles Darwin Research Station. The Charles Darwin Research Station is based at Santa Cruz. Visitors are encouraged to donate to this organization, which carries out investigations and advises the Ecuadorian government and travel agencies on minimizing the impact of tourism on the islands. It contains a national-park information center and a museum. The station is also a tortoise breeding and rearing center, where tortoises of different subspecies are prepared to be reintroduced back to their natural habitat. Small islet located nears the south-east of Santiago. It's shaped like a Chinese hat when seen from afar. It is an island consisting of a cone type "Splash" (lava ejected as droplets and falling close to where it came out, which forms a cone angle) that forms the top, and lava tubes that run down to the coast. In the west you can see lava formations, which are an indicator that the flows were formed under the sea and have been raised towards the exterior, reason why coral heads on lava can be seen. This visit provides an excellent opportunity for the interpretation of geologic features such as lava tubes and lava flows. Also known by the name of Jervis in honor of a British Admiral John Jervis, Earl of St. Vincent. Rabida is located 5 km south of Santiago Island and is commonly regarded as the geographical center of the Galapagos Islands. It has an area of 4.9 km ² and a maximum altitude of 367 meters. It has a high iron content, which causes that this place has a distinctive reddish color. Its main attraction is the salt lagoon with flamingoes, pelicans and boobies place where they build their nests. A tour along the cliffs in a zodiac will give the visitors a good chance to see the Galapagos penguin, the flightless cormorant and other sea birds. From the landing dock it is about a 30 minute hike along the trail up to the top of the cliff from where you can view Darwin Lake, an uplifted ultra saline lake saltier than the sea. You can also see several volcanoes from this location. Look carefully at the graffiti on the surrounding cliffs of the cove, it has been written by pirates, whalers and buccaneers in past centuries. Dry landing, Punta Moreno is located on the north coast of Isabela Island. The route of the trail is approximately 2100 meters. The main attraction in Punta Moreno is the coastal lagoons in the middle of black lava flow where there are several species of birds. 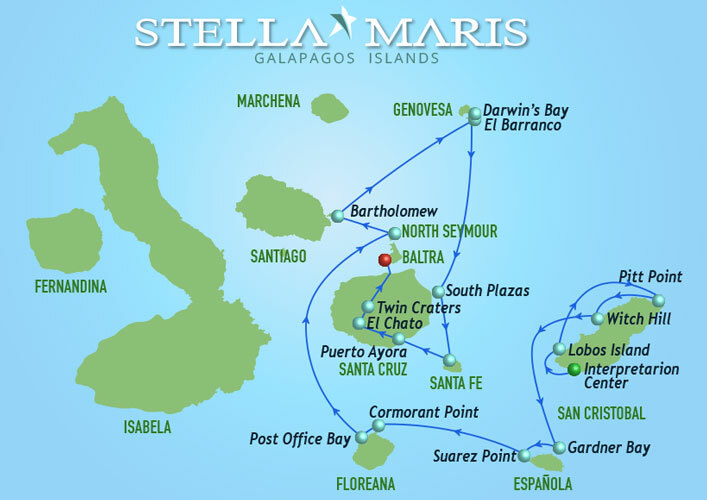 It has a view of 3 volcanoes, the most actives in the Galapagos; Sierra Negra and Cerro Azul. This day will lead you to the largest island of the archipelago, Isabela Island. With a surface of 4588 sq.km the island encompasses more than half the land area of the whole Galápagos. Here you will have a short boat trip through the harbor bay of Isabela. Pass sea lions and pelicans; take a relaxing sunbath on the fishing boat. Eventually, we will reach the small island of “Tintoreras”. Here you will take an easy walk through the bizarre landscape of lava with its huge colonies of sea lizards. Also a colony of sea lions is local here and often you can observe white tip sharks, resting in the flat water near the shore. You will walk with your guide to the historic Wall of Tears. We head up to the highlands from Puerto Villamil to Sierra Negra slope, and later we will do some hiking on uneven terrain until we arrive to the Sierra Negra volcano rim. Sierra Negra is the second widest crater in the world. From this viewpoint, you have fantastic sights to the 6 x 5 -mile-wide crater, the rest of the volcanoes, and Perry Isthmus, a 12 Km wide lava field. From here we can hike to Chico Volcano to watch the striking lava formations, examples of the geological occurrences that have created the Galapagos Islands. We also visit the tortoise birth center of Isabella. Our first stop is at Los Gemelos (the twins), which are a pair of craters approximately 30m deep, it is a Volcanic action underneath the ground made the magna chambers empty causing the above ground to cave in, creating several craters, of which Los Gemelos are the largest. However, our main time in the Santa Cruz highlands will be spent at the Tortoise Reserve EL CHATO, where a number of the endemic Santa Cruz subspecies of Giant Tortoise, “Geochelone elephantopus porteri”, wander freely. The highlands are also home to Scalesia, Miconia, and Pampa vegetation zones. Birds in this area include several species of finch, the vermillion flycatcher, Galápagos rail, Galapagos Dove, and paint-billed cake. We also may have the opportunity to visit the spectacular lava tubes on the island. Wet Landing, interesting walk to the Turtle Bay beach, perhaps the most beautiful beaches in the Galapagos, we can swim and snorkel observing colonies of marine iguanas, pelicans, Darwin's finches, sharks, sharks, sea turtles, the incredible forest Giant Cactus, and the nesting of marine iguanas. Interpretation Center-San Cristobal: dry Landing. This site is educational information about the evolution of the Galapagos Islands and animal life in the islands. Transfer to the airport of San Cristobal. On board, the Stella Maris has a profesional and experienced crew who work hard and with high enthusiasm to make our clients travel experience the best. At the office, our sales and reservations staff answers our clients questions in a timely fashion with efficiency and personal service.